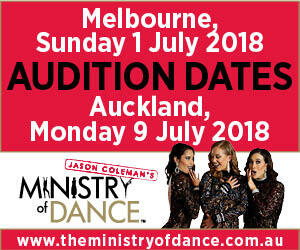 Via DVD, or email ftc@theministryofdance.com.au to arrange a private audition. JCMOD sets the standard of excellence dance, performance and musical theatre training. Is your attitude HARDER? Do you drive to be BETTER? Commence your FASTER? Long to be STRONGER? Join Directors Jason Coleman, Deb Mitchelmore, Eilidh Dragovic and Adrian Ricks through elite training and nationally accredited qualifications in Dance and Musical Theatre. Join us for two years participating in industry delivered classes from Monday to Friday from world-class choreographers and performers, within a university-styled yearly timetable! Enhance your technique, performance, and theory to expand on new genres & styles, and develop longevity in the performing arts industry! A large variety of performance opportunities are on offer to students throughout their studies including (but not limited to); musical theatre shows, corporate events, dance on film, student devised performances and graduation showcases. Alumni credits include; Wicked, The Lion King, Mary Poppins, Aladdin, Book of Mormans, King Kong, We Will Rock You, Grease, Cats, The Australian Ballet Company, Princess Cruises, Norwegian Cruises, The Production Company, Dora the Explorer, Paw Patrol, Humanimals, Razzle Dazzle, The Rhythm of Life to name a few! SUBJECTS: Jazz, Ballet, Tap, Contemporary, Hip Hop, Musical Theatre, Commercial Jazz, Acrobatics, Partnering, Acting, Vocal Tuition, Dance Teaching, Nutrition, Fitness & specialised classes in Performance, Production and Choreography. TEACHERS: Jason Coleman, Deb Mitchelmore, Adrian Ricks, Eilidh Dragovic, Yvette Lee, Romy Vuksan, Jordan Herbert, Arna Singleton, Michael Ralph, Michael Snell, Michael Ramsay, Steven Grace, Nadia Tornese, Steven Ashford, Jarryd Byrne, Mitch Fistrovic, Phillip Haddad, Kenneth Radley, Dana Jolly, Billie Casey-Jabore, Jack May, Anna McGrath, Jane Casson, Kyle Davey, Joe Newton-Keogh, Brittany Page, Diana Ricks and Daniele Buatti to name a few.